Make customers feel at ease that you are an approved CBA partner. By utilizing the badges below or simply including CBA on your partner page you will make sure that when you contact leads through email or phone, they know how you got their information. We only request that you link to us in a complimentary and positive way. If you want to use the graphics below, you can use them as is freely and without any modifications. If you require a different size, please let us know. You can copy and past the associated HTML for any of these links directly to your site. Simply replace the (city) and (state) with the area that you are located in. 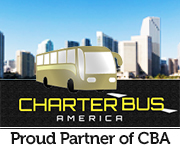 If you would like to link directly to the city or state page that you are located in, simply locate it on the website and then replace the http://www.charterbusamerica.com with the appropriate link. Just email or call us if you need any help.